While many Americans who frequent coffee shops like Starbucks and Dunkin’ Donuts believe that their coffee purchases are helping the environment by expanding the coffee industry and by extension, the growth of coffee trees. It turns out the opposite may be true. A recent study published by BioScience reveals that the expansion of the coffee industry has actually been harming the environment due to the increasing prevalence of full-sun coffee farms. The natural habitat for these types of plants is one filled with shade under a massive canopy of trees, where wildlife can thrive, soil becomes healthier, and the trees offer a host of other benefits to the surrounding environment. The researchers conducting the study pointed out that not only do full-sun farms degrade the environment, but the coffee itself cannot flourish with the sun beating down on it constantly. Statistics associated with the study show that the number of farms using shade dropped from 43 to 24 percent between 1996 and 2010, at which point over 40 percent of coffee farms utilized no shade whatsoever. These numbers were most drastically affected by the vast increase in the coffee industries of Brazil and Vietnam, where the evidence shows that over three quarters of the coffee grown on farms in those nations sees no shade at all. 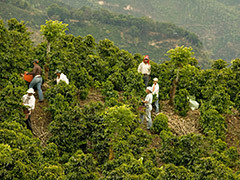 In addition to the loss of so many natural environmental benefits, growing coffee in full-sun conditions requires more pesticides, due to the lack of birds and other animals that can control the insect population, not to mention more fertilizers because the plants are surrounded by fewer areas of rich soil. Many people even argue that coffee grown in these conditions tastes off. While buying organic or fair-trade beans may help the problem, the only way to guarantee that coffee was grown in shaded conditions is to buy coffee that has been certified by either the Rainforest Alliance or the Smithsonian Migratory Bird Center. Geoengineering: Nonfiction or Science Fiction? Posted on July 14th under Global Ecology.